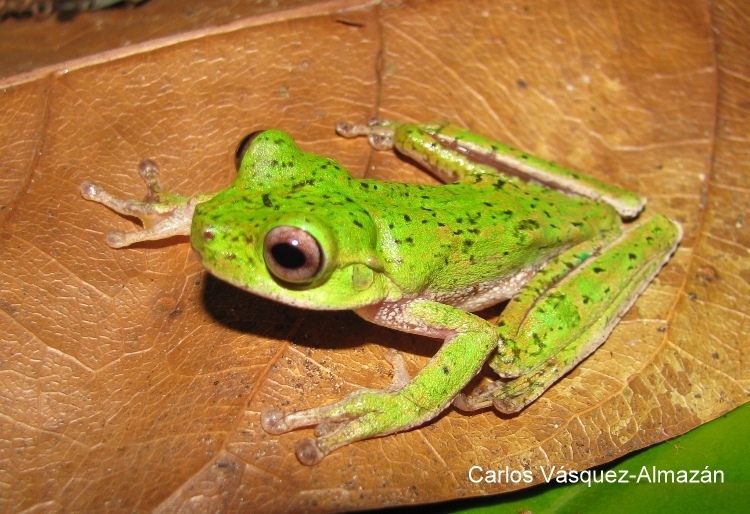 The skin of the males of the Chinamococh Stream Frog (length around 3cm) is lime green scattered with pale green spots across its back, with yellow-green hands and feet. A narrow strip of reticulated pattern runs down its sides, dividing the green of its back with its yellow underside. The females are olive green with small white spots, and otherwise looks similar to the males, both with pale brown-coloured irises. These nocturnal frogs can be found asleep on leafy perches nearby streams during the day, and active (hunting and calling) at night. Their call was described by the scientists who published the species discovery in 1992 as a ‘soft, stuttered “wraack”’. If these calls are successful and mating is achieved, females can lay around 150 eggs in the same night. This frog’s species name, P. sanctaecrucis, indicates its limited range in the subtropical wet forests of the Santa Cruz mountains (it is endemic to Sierra Santa Cruz, hence the species name ‘sanctaecrucis’), where they can be found sitting on vegetation on or above small clear streams. The Chinamococh Stream Frog is classified as Critically Endangered by the IUCN Red List because its known range in Sierra Santa Cruz is less than 100km² within 366-1,150m altitude of the mountain range. This habitat is declining in size and quality due to expanding agriculture, wood extraction, human settlement and water pollution. The other major threat is the fungal disease chytridiomycosis, caused by a chytrid fungus, which is highly infectious to amphibians and is thought to be a major factor affecting declining amphibian populations worldwide. 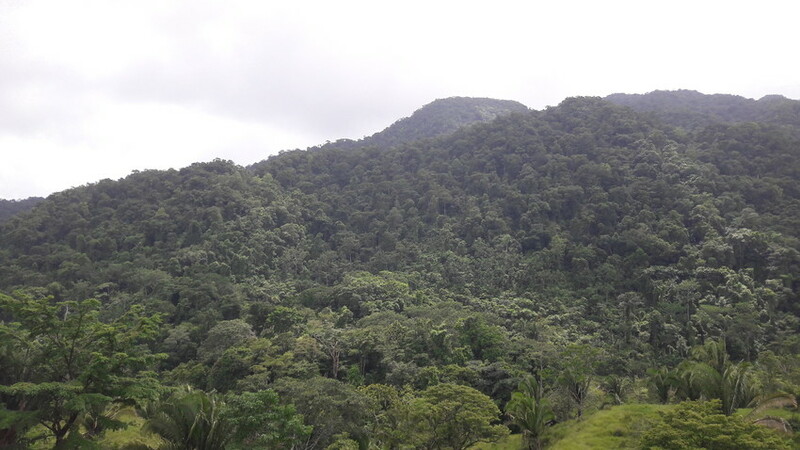 Declines due to this disease have already been detected amongst other species of the Ptychohyla genus in Guatemala. Campbell, J. A., & Smith, E. N. (1992). A new frog of the genus Ptychohyla (Hylidae) from the Sierra de Santa Cruz, Guatemala, and description of a new genus of Middle American stream-breeding treefrogs. Herpetologica, 153-167. Manuel Acevedo, Eric Smith. 2006. Ptychohyla sanctaecrucis. The IUCN Red List of Threatened Species 2006: e.T55917A11391338.